3 - 2...................Vello von Fürstenfeld. 4 - 3...................Bordo von Fürstenfeld. 4 - 3...................Citta von Fürstenfeld. 5,5,5 - 4,4..........Lump von Hagenstolz. FCI World Champion in 1979. Bronco vom Zenn passed the Körung 'for life' with Körklasse 1A rating plus was a winner of numerous show championships. He lived to 7½ years of age and the cause of death was bloat. His sire, Jago von Beelen, passed the Körung 'for life' with highest rating for hardness and working drives and his dam, Elke vom Pfälzer Waldheim, passed the Körung 'for life' with Körklasse 1A rating. 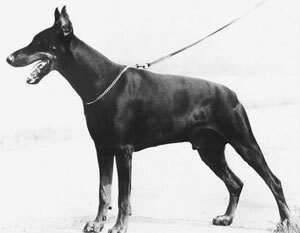 “This black male was the most successful dog in Germany for some years. His tremendous success surprised a lot of financiers because his result in the ZTP (Fit for breeding test) had not bee that good. For conformation he was only graded 'Very Good'. However he passed the Test because of his character. in 1981 at the World Winners Show Mr. Wiblishauser wrote: “a black male of correct size with substance. He has a strong topline, correct tailset, stands correctly on his feet, good hind angulation, good deep chest, tight feet, dark tan and moves correctly”. He became German and International Champion and in 1979 gained the Bundessieger-title and the title at the World Show. This surprised a lot of financiers who disliked his head type and heavy body which lacked elegance. He also appeared rather short in the leg. Alexa: SchH 3 and passed the ZTP with V for conformation plus winner of numerous show titles. She is dam of the vom Flandrischen Löwen “A, B, C” litters (Atlas, Alida, Amida, Bella). Kuno: SchH 3 and passed the ZTP with 1A rating for character and V for conformation. Muse: SchH 3, FH, DV-DM participant and passed the Körung 'for life' with Körklasse 1A rating. She is dam of the vom Emstal “A, B” litters (Alf, Anjuschka). Ilk: SchH 3 and passed the Körung with Körklasse 2A rating. He is sire of the vom Gaxhardter Wald “M, O, R, T” litters (Oniv, Romeo, Toxi). Kessy: SchH 3, FH and dam of the vom Hause Ehrlich “F, H” litters (Fridolin). Athene: dam of the vom Pfaffenberg “C, E, G, H” litters (Esta). Bastian: IPO 3 and Belgian B.D.C.B. IPO Champion in 1982. Bärbel: SchH 3, DV-DM participant, AIAD-Leistungssieger and passed the Körung with highest rating for working drives. Beatrix: SchH 1 and dam of the vom Steinbachtal “B” litter (Britta). Bianca: SchH 3, FH, DV-DM participant and dam of the vom Hause Ehrlich “E, K” litters (Erwin, Emmely, Eve). Ere-Iris-Ezra: SchH 3 and passed the Körung with highest rating for hardness and working drives plus winner of numerous show titles. She is dam of the van Diaspora “F, G, I” litters (Fabiana Fusciana, Flegon Falek, Gog Goliath). Golf: SchH 3, FH and passed the Körung with Körklasse 1A rating plus winner of numerous show titles. He is sire of the von Frankenland “D, E, X” litters (Dino). Ilka: IPO 3 plus winner of numerous show titles. She is dam of the von Frankenland “Q, U, Z” litters (Udine, Unessa).